(Nanowerk News) How do individual cells or proteins react to changing pH levels? Researchers at the MESA+ Institute for Nanotechnology at the University of Twente have developed a technique for ‘gently’ adjusting pH: in other words, without damaging biomolecules. This should soon allow them to measure the activity of a single enzyme as a function of pH. The researchers will publish their findings in the journal Lab on a Chip ("Field-effect based attomole titrations in nanoconfinement "), which will devote a cover story to their research in the December 21st issue. 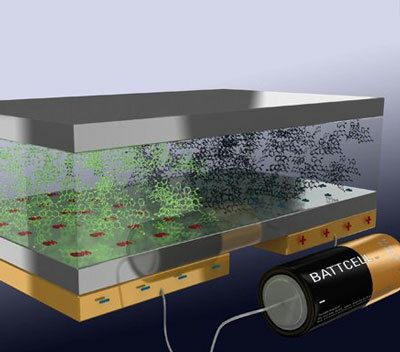 This lab-on-a-chip illustration shows an impression of how gentle titration works: protons are attracted to, or released from the silicon-nitride surface. variations in pH result in a different light intensity in the nanochannel. Current methods for adjusting pH often have unpredictable effects on the immediate environment of a cell or biomolecule. Electrochemical reactions may occur that affect measurements, or pH levels may not change rapidly enough. It is then difficult to determine exactly what happens when the pH changes, or the measurement itself may even produce unwanted side effects. Researcher Rogier Veenhuis and his colleagues have developed a technique which resembles traditional titration, but which is controlled electrically and takes place using extremely small volumes of solution. The greatest benefit of this technique is that there are no undesirable side effects: it is a 'gentle' approach. The researchers achieve this effect by using silicon nitride for the base of the micro and nano fluid channel, under which an electrode is attached. The electrode is given a negative charge which results in protons being attracted to the nitride surface. This causes the solution to become more basic and the pH rises. A positive charge results in the opposite effect: protons are released from the surface, the solution becomes more acidic and the pH decreases. There is no reaction on the electrode as there would be during electrolysis because the silicon nitride acts as an insulator: this arrangement creates a kind of capacitor. Acidity can be adjusted by 'fiddling with the knob' to change the electrical current. The changes can be made visible by introducing a fluorescent pH indicator to the solution: light intensity reflects changes in pH. This new method of titration takes place in extremely small quantities of fluid; substances can be titrated in the attomol range (10-18 mol). This should soon allow the researchers to measure the activity of a single enzyme as a function of pH. The research was conducted by the BIOS Lab-on-a-Chip research group of Prof. Albert van den Berg, who recently won one of the three 2009 Spinoza Prizes. The research group is part of the MESA+ Institute for Nanotechnology of the University of Twente.